To leave San Pedro de Atitlan we had planned to ride around the lake past it’s triumvirate of monster volcanoes and on to Antigua, the former capital of Guatemala. Unfortunately there have been a number of attacks on tourists recently on the very road we need to take and we are warned against riding. Yeah, yeah we think everyone gets a bit twitchy after minor incidents, but on asking around the response is surprisingly firm and constant. Do Not Go That Way! When a US army veteran recently retired to this area explains that even he takes a bus, we decide maybe the rumours are not exaggerated and we reluctantly agree to take the bus. Apparently there is a group of bandits who make a living preying on tourists, robbing them at machete point before melting back into mountain terrain that makes them impossible to find. Every few months a group of vigilantes forms a posse and tries to hunt them down, with the result that they go to ground before reappearing in a new location somewhere else round the lake. It’s proper wild west stuff! We just have to rationalise the bus ride is not cheating as the lake is a side trip and we will ride the route back from Antigua to the lake junction - all the miles will get ridden…. We have a few days to kill as Anna and Ali are set to return after Anna’s father’s funeral and we’re going to ride together again so we extend our stay in Antigua. Being the nation’s capital for 233 years until a massive quake levelled the city in 1773, Antigua has some fine old relics of buildings, many sadly now ruined. Others have been restored to former glory such as Iglesia de la Merced…. The city itself is spectacularly located and surrounded by 3 more giant volcanoes - Vulcan de Aqua, Fuego and Pacaya. At 3759m (12400 feet) Vulcan de Aqua provides a stunning backdrop to Antigua’s signature building - Los Arcos…. Close proximity to Guatemala’s new capital - the imaginatively named ‘Guatemala City’ ensures a regular flow of well healed weekenders and Antigua has more than it’s fair share of fine restaurants, swanky hotels and boutique shopping, sadly all beyond our modest budget. There are however enough cheap Chinese restaurants and back street bars to keep us interested. 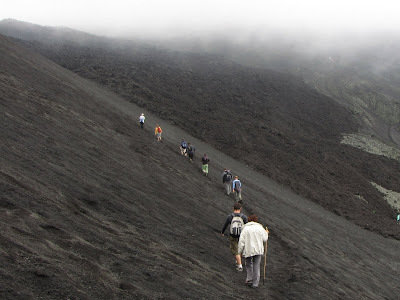 And one of the volcanoes is still massively active - so we have to climb it! Vulcan Pacaya erupts constantly and there are several flows of fiery hot lava coursing down it’s steep flanks. We’d be fools not to try and get as close as possible to something as dangerous as that! To the West are clear skies and the impressive sight of Vulcan de Fuego, another active cone coughing and spluttering into life…. It’s a moderate 2 and a half hour hike up slippery pumice and ash before we reach the tortured summit of sharp, twisted rock. Hot sulphurous blasts of fetid air rise from the bowels of hidden underground vents…. Like the final scenes from ‘The Lord of the Rings’ we finally approach conveyor belts of super heated rock flowing from a fault in the blasted land. Note Sue’s walking stick ‘a la hobbit’ as she flees the intense heat of molten magma, selfishly spoiling an otherwise rather nice photograph…..
To be fair to her though, standing within 4 feet of lava is a tad on the warm side and I lose all the hairs on my legs in a swirling wind that raises the local air temperature to inferno levels. Wearing hiking shorts was not a wise decision with hind sight. In less enlightened countries there would possibly be a barrier in place to stop accidental immolation, or maybe just a sign explaining that; like McDonalds coffee, lava can be hot and pouring it in your lap is not recommended…. We retreat to a sensible distance and roast marshmallows…. In Antigua we reside with Edwin - proprietor of ‘Guate Linda Language Centre and Hotel’ and all round fine fellow, whose excellent establishment can be viewed here. He’s a fantastic host and shows us the ropes around his town. What he doesn’t know is that we can hear the Spanish lessons taking place outside our bedroom window and we’ve spent the entire week getting free Spanish lessons….